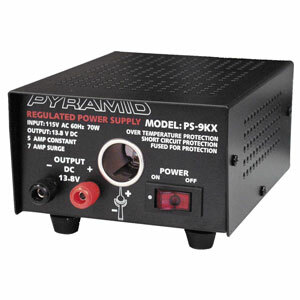 This power supply features binding posts and a cigarette lighter jack for increased versatility! Perfect for powering 12V devices that draw up to 5 amps. Heavy duty steel housing with short circuit and overload protection. Specifications: * Output Voltage: 13.8 VDC (fixed) * Output Current: 5 amps (cont), 7 amps (surge) * Ripple Voltage: Less than 3mV at rated output * Input Voltage: 120 VAC, 60Hz * Weight: 6 lbs.